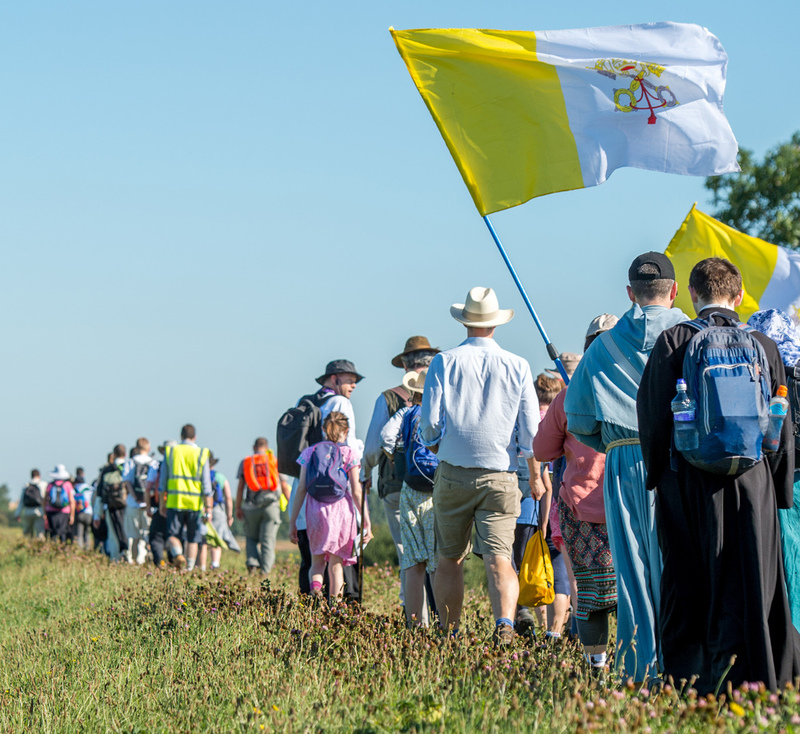 On the last weekend of August, the Society holds its Annual Walking Pilgrimage to Walsingham, covering 59 miles of paths, tracks, and roads, in the footsteps of countless pilgrims since before the Norman Conquest, for the Conversion of England. In 2018, LMS pilgrims were accompanied by Fr Michael Rowe from Perth, Australia, and Fr James Mawdsley FSSP. There was also a Friars from Gosport and FSSP Seminarians. We’ve been joined over the years by secular clergy, and members of the ICKSP and the F.SS.R. from Papa Stronsay. Our tireless support team includes three drivers and cooks, as well as leaders of chapters, marshalls, and singers. In 2018, we had more than 60 pilgrims, of whom more than 20 were children and students. The Pilgrimage in 2019 and beyond is only going to be possible with the help of you, our pilgrims’ sponsors. - Pray for you, with your name, as ‘anon’, or ‘in memoriam’ or your deceased loved ones, listed in pilgrims’ information packs. - Offer Mass for you during the Pilgrimage, on the Saturday morning. - Carry your petitions, in written form, by foot from Ely to Walsingham, for deposit beneath the Shrine image in the Slipper Chapel. If you wish this donation to be given in memoriam of a loved one, please leave their name here. This name will appear in the Pilgrim's information pack in place of your name.